The secondary market is where investors buy and sell securities from other investors (think of stock exchangesStock MarketThe stock market refers to public markets that exist for issuing, buying and selling stocks that trade on a stock exchange or over-the-counter. Stocks, also known as equities, represent fractional ownership in a company). For example, if you go to buy Apple stock, you would purchase the stock from investors who already own the stock rather than Apple. Apple would not be involved in the transaction. Examples of popular secondary markets are the National Stock Exchange (NSE), the New York Stock Exchange (NYSE), the NASDAQ, and the London Stock Exchange (LSE). The secondary market helps measure the economic condition of a country. The rise or fall in share prices indicates a boom or recession cycle in an economy. The secondary market provides a benchmark for a fair valuation of a company. The secondary market helps drive the price of securities towards their genuine, fair market value through the basic economic forces of supply and demandLaw of SupplyThe law of supply is a principle in economics that an increase in the price of goods sold will have a corresponding direct increase in supply by producers. The secondary market promotes economic efficiency. Each sale of a security involves a seller who values the security less than the price and a buyer who values the security more than the price. The secondary market allows for high liquidity – stocks can be easily bought and sold for cash. There are two types of markets to invest in securitiesMarketable SecuritiesMarketable securities are unrestricted short-term financial instruments that are issued either for equity securities or for debt securities of a publicly listed company. The issuing company creates these instruments for the express purpose of raising funds to further finance business activities and expansion. – the Primary Market and Secondary Market. These two markets are often confused with each other. This is the market where securities are created. In the primary market, companies sell new stocks and bonds to investors for the first time. This is usually done through an Initial Public Offering (IPO)Initial Public Offering (IPO)An Initial Public Offering (IPO) is the first sale of stocks issued by a company to the public. Prior to an IPO, a company is considered a private company, usually with a small number of investors (founders, friends, families, and business investors such as venture capitalists or angel investors). Learn what an IPO is. Small investors are not able to purchase securities in the primary market because the issuing company and its investment bankers are looking to sell to large investors who can buy a lot of securities at once. The primary market provides financing to issuing companies. This is the market where securities are traded. 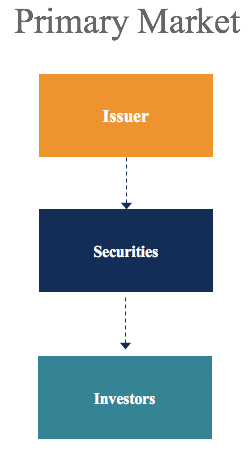 In the secondary market, investors trade securities without the involvement of the issuing companies. Investors buy and sell securities among themselves. The secondary market does not provide financing to issuing companies; they are not involved in the transaction. The amount received for a security in the secondary market is income for the investor who is selling the securities. The primary market provides interaction between the company and the investor while the secondary market is where investors buy and sell securities from other investors. Securities traded through a centralized place with no direct contact between seller and buyer. 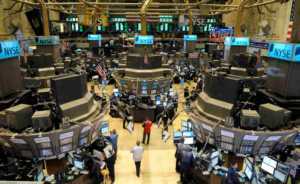 Examples are the New York Stock Exchange (NYSE) and the London Stock Exchange (LSE). In an exchange-traded market, securities are traded via a centralized place (for example, the NYSE and the LSE). Buy and sell is conducted through the exchange and there is no direct contact between sellers and buyers. There is no counterparty risk; the exchange is the guarantor. Exchange-traded markets are considered a safe place for investors to trade securities due to regulatory oversight. However, securities traded on an exchange-traded market face a higher transaction cost due to exchange fees and commissions. No centralized place where securities are traded. The market is made up of participants trading among themselves. An example is the foreign exchange market (FOREX). Securities can be traded on both exchanges and over-the-counter markets. In the over-the-counter market, securities are traded by market participants in an decentralized place (e.g., the foreign exchange market). The market is made up of all participants in the market trading among themselves. Since the over the counter market is not centralized, there is competition between providers to gain a higher trading volume for their company. The prices for the securities vary from company to company. Therefore, the best price may not be offered by every seller in an OTC market. Since the parties trading on the OTC market are dealing with each other, OTC markets are prone to counterparty risk. Investing: A Beginners GuideInvesting: A Beginner's GuideCFI's Investing for Beginners guide will teach you the basics of investing and how to get started. Learn about different strategies and techniques for trading, and about the different financial markets that you can invest in.